The beauty of the TD Banknorth 250 is that until the morning of the race, the entry list isn’t very well known. The race is on Sunday and how their Saturday night races went makes a difference when it comes to just who will be showing up for the event. Slowly, the participants of the Roush Racing tryout known as “The Gong Show” are being known. The project features 25 young short track drivers who have been selected from a pool of thousands to compete in a televised Discovery Channel program with the winner getting a ride in the NASCAR Craftsman Truck Series with Roush in 2006. This week, Speed51.com learned that NASCAR Whelen Modified Tour driver Nevin George is one of the 25 finalists. Obviously, George is thrilled to be a part of such an exclusive group. Sam Sessions might ride again this weekend. Johnny Clark’s biggest race of the season is on Sunday when he takes to the track for the TD Banknorth 250. The next day is almost going to one of the biggest days of his life, as he will arrive in North Carolina for the first day of the Roush Racing “Gong Show” tryouts. It could be an interesting few days for Clark, but at the same time he is trying not to get too excited about it. Somehow we don't think that Clark will mind the lack of rest if he takes home the trophy from the 250. Johnny Clark might need a cold Gatorade bath to wake him up after the busy week he has ahead of him. Mark Truman of Late Model Digest puts together the most comprehensive fan website about the 250 that is out there [Click here for more]. The Maine writer reports that Sam Sessions will come out of a racing hiatus for this weekend’s race. Truman also reports that Canadians Dave Gorveatt and Scott Alexander will attempt to qualify this weekend. 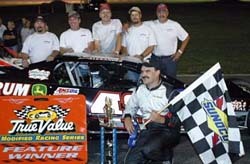 Over in the True Value Modified Racing Series, it was another race with the same final result this past weekend. Kirk Alexander won his seventh race in nine events this season. 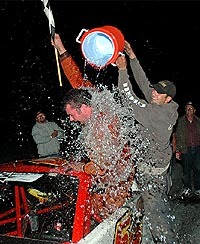 This victory came at Star Speedway (NH). Pre-entries? Ha! You just never know for sure how will be there. Still, a few names are starting to trickle in when it comes to how will be at the event. Gary Casella, Andy Seuss and Jim Kuhn, Jr. battled for the lead early with Alexander starting dead last, but the cream rose around the halfway mark as Alexander got into the lead and stayed there. He held off Louie Mechalides, Kuhn, Dwight Jarvis and Peter Daniels for the victory. Alexander is now within one point of the TVMRS points lead. Odd as that might sound, this fact is very impressive since the two races where Alexander did not win, he was excluded from the final results because of a technical violations and an on track incident. The TVMRS will race at Monadnock Speedway (NH) this Saturday night. The TD Banknorth 250 won’t be the only race at Oxford Plains Speedway (ME) this weekend. In addition to the huge Pro Stock (Super Late Model) open event and the track’s regular divisions, there are a few other race events on tap leading up to the big race. The PASS Modifieds will run in the Stilkey Trucking 35 on Friday night and the ACT Late Models will headline the Saturday night racing card at Oxford with an 100-lap event that was rain delayed in May and rescheduled to the track’s biggest weekend of the year. The ACT Late Models have been enjoying a little bit of an early summer vacation, but several teams of the tour have been keeping busy. The majority of the ACTers compete on Thursday nights in the Late Model division at Thunder Road Speedbowl and this past weekend, several teams hopped on the ferry across Lake Champlain to compete in a 100-lap Outlaw late model race at Airborne International Raceway. Patrick Leperle held off Brent Dragon and Roger Brown to win the event, but the most interesting storyline was a little bit further back in the pack. New England racing legend Beaver Dragon came out of retirement to enter the race in a team car to his son Brent. He finished 12th. Also at Airborne was former Busch North driver Keith Lammel, who has been out of the driver’s seat for nearly a decade. The winner of a 1994 Busch North event at Stafford Motor Speedway (CT) had brake problems at Airborne, but could be primed to enter more Late Model events this season. Beaver Dragon drove the #56 as a team car to Brent's regular #55.